The WEC Group which specializes in small to large fabrication, laser cutting, CNC Machining, waterjet cutting, and heavy engineering has revealed it has bought a six acre site at the Walker Business Park in Blackburn. The company which already boasts a 425-strong workforce has now won planning permission to create a new 120,000 sq ft plant on the site as it looks to continue its growth in several sectors including in the aerospace sector. This new investment comes on the back of an ambitious expansion plan that has already seen the Group open 2 new factories in Blackburn in 2013, creating 50 jobs in the process. WEC carries out subcontract engineering work for industries ranging from rail, automotive, and to offshore oil and gas extraction. Its manufacturing ranges from footbridges and bus frames, to log-fired stoves and street furniture across 12 divisions and with operations in its home town of Darwen as well as Blackburn, Knowsley on Merseyside and Leeds. The group is also currently looking to utilise available capacity at its West Yorkshire plant, which currently manufactures bus structures, with new subcontract work following extensive investments in robot welding technology. And looking further ahead WEC's rail division is hopeful of securing work as a result of the proposed HS2 infrastructure programme. The group's new Water Jet Division which was launched at last year's Subcon Show in Birmingham is also seeing strong growth, after sealing a £750,000 order from the offshore industry. The Group commissioned their second dynamic waterjet machine in January, only 6 months after buying the first one, and bosses have already their eyes on a potential third machine with larger bed size to accommodate the high demand. The privately owned group, which is the largest subcontract engineering company in the North West, also has export expansion in its sights, following successful forays into the Middle East market. WEC has launched a Middle East Division looking at the Gulf States after sealing a £1 million order in the region for its CCTV structures business. WEC also continues to invest in the future, with the only in-house welding and fabrication training academy in the country. Over ten per cent of its workforce are now apprentices as the company works to tackle the skills shortage in the industry. Wayne Wild, group commercial director of the WEC Group, said: "We are excited about our expansion plans at the Walker Business Park. "The land we have bought gives us much-needed space to grow as our other sites are near capacity in size and in operation. So this really is a statement of future intent by us. "We continue to invest in machinery and in our workforce as we look to continue our growth. We see aerospace as a sector where we can make great strides and we are actively working to ensure that happens. "Our Water Jet division is looking strong, thanks to the additional technical investment it has received. It recently delivered a major offshore order in just six weeks, which is an industry record. "Our division in Leeds, which manufactures and builds bus frames, also has great potential for expansion and again we are actively working to achieve that and to seek out new business. "In the longer term we are hopeful that the HS2 project will provide great opportunities for our rail division, which is already creating a variety of structures for the industry." 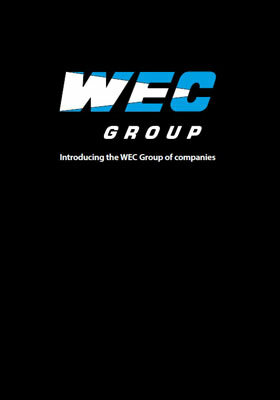 The WEC group was founded in 1979 by business partners Steve Hartley and Ross Place. As managing director Steve Hartley continues to expand the business by overseeing the creation of new divisions and the latest, Goose Foot Street Furniture, has been launched in 2014 specialising in making street furniture with local authorities its main customers. Steve said: "We have developed a new range of street furniture and we are looking to take on extra staff as we grow that arm of our business. "There is no secret to our growth over the past few years. It is based on continual investment in the most modern cutting-edge machinery. We have invested in the region of £5 million over the past three years. "We've also continued to diversify and to develop businesses across the whole spectrum of the engineering sector. Again this has been done by reinvesting profits." 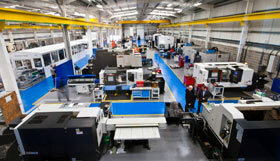 WEC other long established divisions are also currently benefitting from investments, and the WEC Machining which already benefitted from £2m investment in 2013 to relocate to purpose built premises will take delivery of an additional three New Vertical Machining Centres in May from the manufacturer HAAS.